It’s almost (officially) fall here in the States and fall means apples, leaves changing colors, pumpkins and, of course, Halloween. 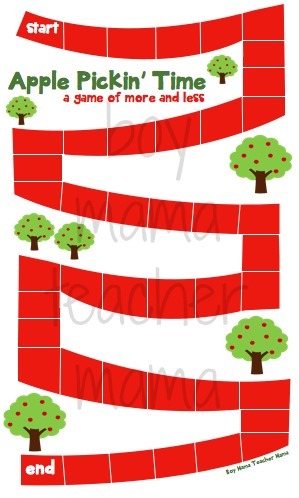 Last year at this time, I shared our FREE Apple Tree Math printable and it was a big hit. This year, I have created something slightly different, but still kept with the fall themes. We are working on the concepts of more and fewer, greater and less and the same in my first grade class. Although it seems like a pretty simple concept, it is extremely important for more challenging math that comes later in the school year. 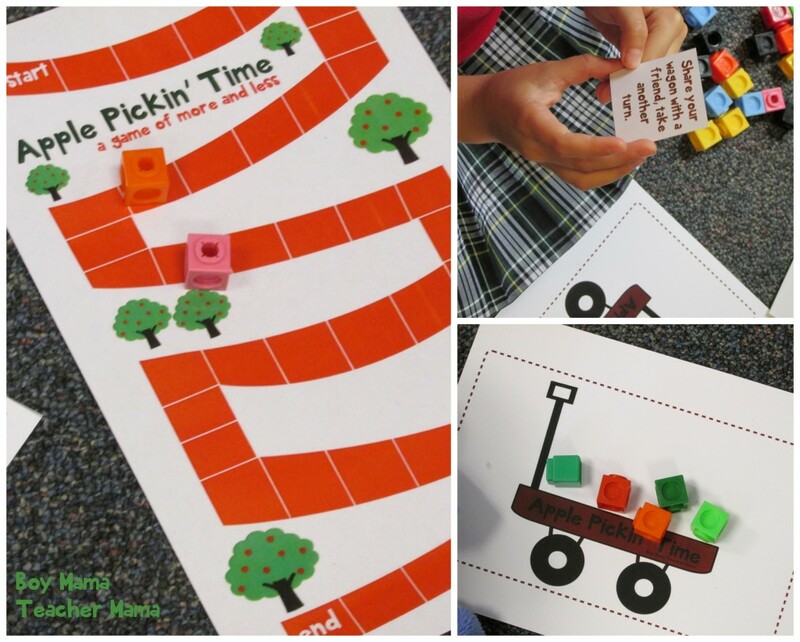 I am going to use this game in my classroom starting tomorrow and hope that the kids enjoy it. Print all the game board. Print and cut the playing 3 types of playing cards apart. 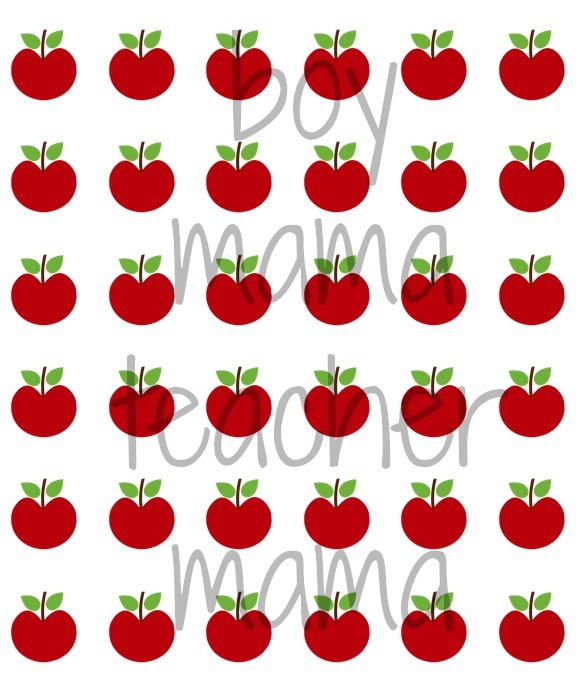 You can back the cards with the apple print background paper if you like. Print one wagon for each player. 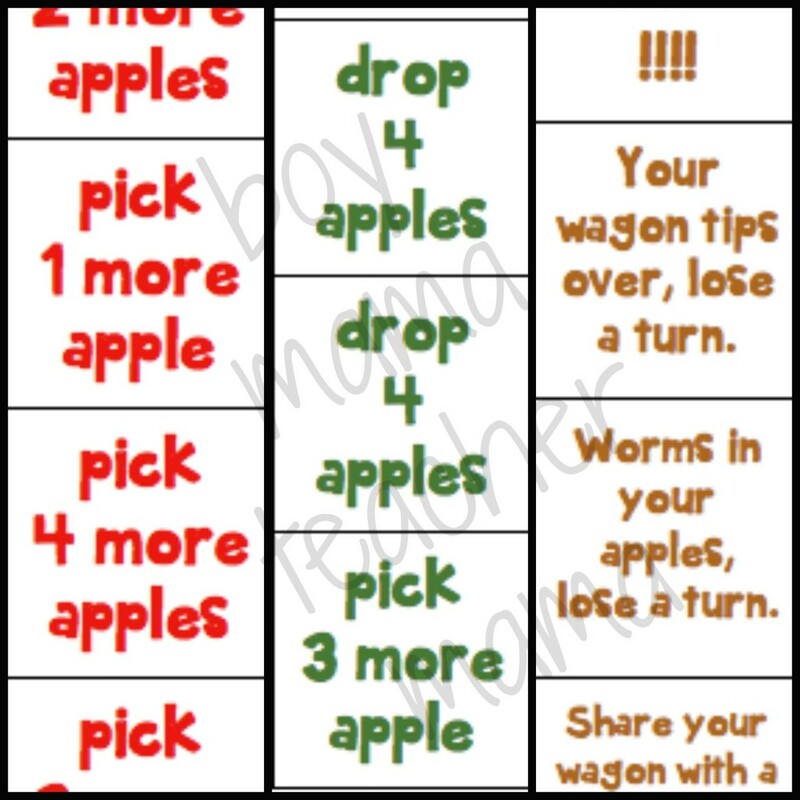 Cut out apples to use in the wagon. Once these materials have been prepared, you are ready the play! Player one rolls a die and moves that many spaces. 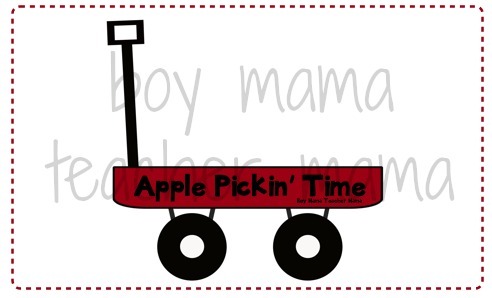 He then follows the directions on the card adding apples to his wagon or taking them away. I have a four year old who is going to love this. Thanks for sharing! What a fun way to incorporate Fall into a math lesson. 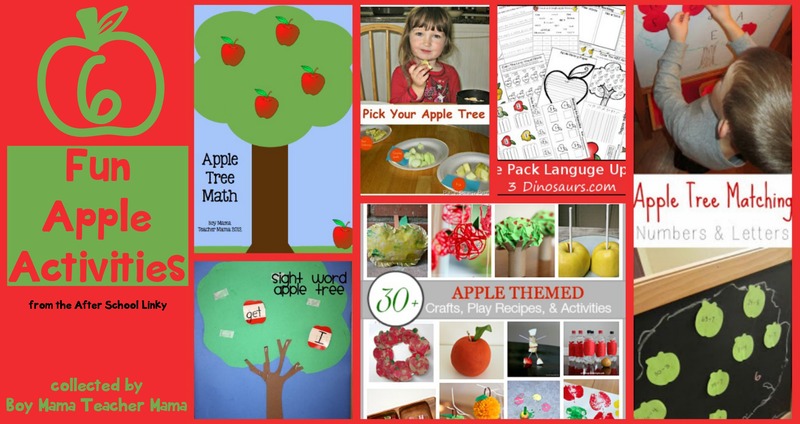 Thanks for sharing Stephanie and rounding up all of the apple activities! That’s what we’re hoping to focus on next week! Not only is this game super cute, but I love the math practice! Thanks for sharing!! 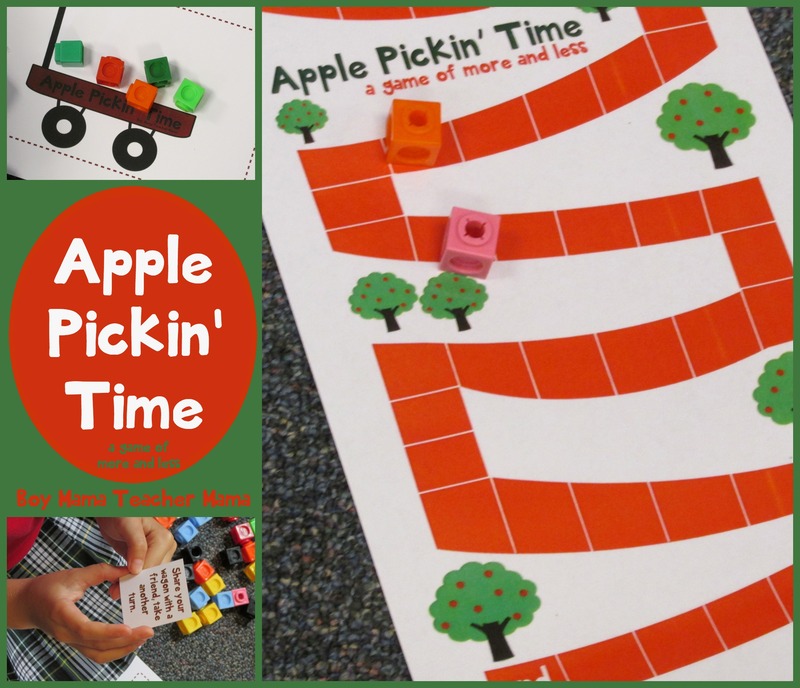 Perfect fall apple fun! Very cute game.